They say it is better to give than to receive. True enough, hence receiving a gift even a simple little something is a joy to the heart. It is not about how expensive or huge the thing is but the value and happy memories with it. Years ago, I was frustrated to receive a teddy bear gift. Yes, it sounds shallow to hear from me that I haven’t received a stuffed bear gift all my life, so awful. When I was a child, my parents used to buy me dolls and art materials until I became an adult then realized that I never had a teddy bear gift all my life. This situation made we wish that my future lover should give me one. Unluckily, I am still single. 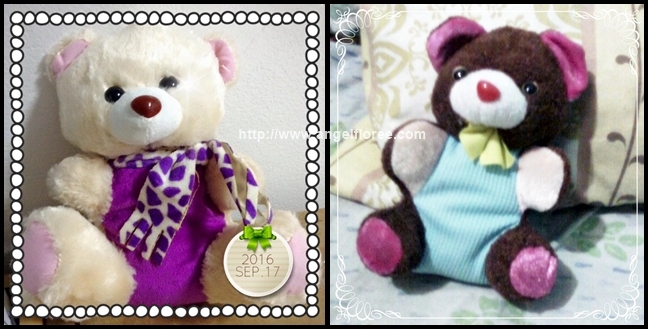 Last 2012, my friend Karen gave me a small dark brown bear due to my insistent demand, never would I expect to receive one. Although it is small and I know it is not that super fancy, I know it was given from the heart making it priceless in my eyes. My crush back then looked chubby and tall, looking like one, I texted him for some name suggestions. He jokingly suggested the name “Bogart”. From that day of naming him, I had Bogart as my companion in the remaining months of my stay in the Philippines then also brought him with me here in the Middle East where I have been working for more than three years. He is now inside my Balikbayan box on the way to the Philippines for I will go home in my country in a few months. There were a lot of memories I had with that little stuffed bear. Whenever I go to places, never would I forget to take pictures of him. My new little bear is named Eden. She is named after my friend who gave her to me. Weeks ago, I and my friends went into a thrift shop where all the prices of goods were the same. Everything could be bought from cooking wares, clothes, accessories and toys. I saw a cute bunch of small teddy bears in a corner. I then teased my friend, Eden to buy me one as a remembrance since I am going back to the Philippines early next year. After some endearments, she told me to choose one because she already agreed to buy one for me. I felt thrilled as a child. We went back home with my new little creamy white bear in my arms. Sounds childish but I really have this unique regression in teddy bears and now extra happy that I have a new one. This act of giving something even though simple can make us smile. We will feel a surge of affection to the giver. A small token of appreciation will not only make the receiver know that he is remembered but also make someone’s day bright and could take the sadness away. A Sense of Appreciation: Receiving a small Thank You Card with home baked goodies from someone you helped out to make some chores gives a feeling that he appreciates the good deed you have done. To feel appreciated is very rewarding and fulfilling. Takes your Sadness Away: When you are having a bad day with sad emotions, receiving flowers with a thoughtful note to cheer you up could make you smile, chances are this thoughtful act could lessen if not forget your sorrows away and there are people supporting you in what you are going through. Open your Mind on Situations: A simple stuffed animal with a letter saying that you are sorry might lighten your resentment or ill-will on someone you are not in good terms with. However, it would still depend on your readiness. A Feeling that you are loved: When a boy likes a girl, it is indeed pleasant for her to receive some surprises like roses and teddy bears. Sounds common but it is a nice feeling for her to feel showered with love through this kind of effort. Some may be skeptical about receiving material gifts but somehow this is one of the best ways to make someone that he/she is valued. Receiving a something from someone does not mean that things have a price or there is a requirement to receive something in return. It is not the quality or expensiveness that matters but the thoughts we give with it. How about you? What is the best gift you have received from someone so far?